The nose has lime Opal Fruits and drumstick lollies - it's a second childhood! There's also a faint hint of sherbet in there. The mouthfeel is thin and a little drying. The body has peaches, lemon sherbet, vanilla sponge cake and a little lime, which continues into the finish and is joined by the lemon sherbet and vanilla. The finish itself is quite lasting. Water brings out tight, thin whorling that rapidly expands and vanishes. The nose now gains peaches and loses the Opal Fruits and drumstick lollies. The lemon sherbet is much more dominant. The body is similarly more lemony, with a little cinnamon and plenty of vanilla. The hint of cinnamon continues into the finish. 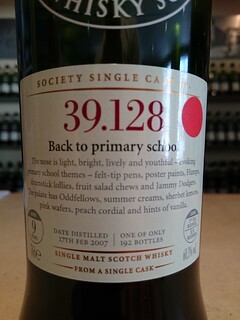 A great light fruity dram for the fading summer's light. 48.76 - The freshness of citrus! 50.78 - Ready... steady... bake! 64.74 - What afternoons are made for!